Pulsair presents the fastest and most efficient clearwell water tank mixer. The Pulsair mixing process works by producing sequentially timed pulses of compressed air to generate large bubbles at the tank bottom. The rising bubbles create an immediate vertical circulation pattern that stirs and blends 100% of the water in the tank. The Pulsair water tank mixing process is the fastest and most energy efficient because it uses gravity to do the work of mixing. The only energy consumed is during the process of compressing the air. Once the bubbles are released at the tank bottom, no more energy is consumed. The water in the tank continues to move long after the bubbles reach the water surface. The Pulsair system uses large compressed air bubbles to quickly mix new water and chemical disinfectants at the injection location. This fast mixing results in increased contact time (CT) between the water and disinfectants to provide clean, safe water for the public. Pulsair uses high quality materials to guarantee long-term system performance. These proven materials are sanitary and used to protect public health. Our potable water equipment is NSF/ANSI Standard 61 Certified for use in public drinking water supply systems. Every Pulsair clearwell mixing system is custom designed and built to fit specific tank profiles. We have nearly 30 years of experience designing high quality pneumatic mixing systems that require very little maintenance and are extremely energy efficient. The Pulsair Systems will meet your project requirements to help ensure the treated water complies with the Safe Drinking Water Act (SDWA). Mixing parameters can be changed with simple touchscreen controls allowing the operator to adjust and adapt to changing conditions and flow rates in the clearwell and water treatment process. The Pulsair mixing process has no moving parts in the tank. 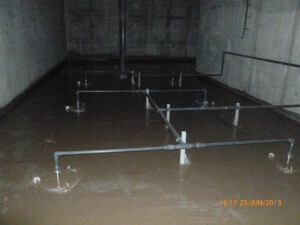 Once the equipment is installed in the clearwell, any required maintenance is minimal and done outside the tank. This significantly reduces maintenance cost and eliminates costly downtime. The Pulsair mixing process cycles intermittently, which conserves energy and reduces total operating costs. The combination of thermal stratification and the location of water inlet and outlets can potentially cause short-circuiting in clearwells. Pulsair’s mixing process ensures 100% of the water in the tank is thoroughly mixed, which maintains longer disinfectant contact time (CT), uniform temperature distribution and consistent water quality without any deadzones. Why use the Pulsair Clearwell Water Tank Mixer?